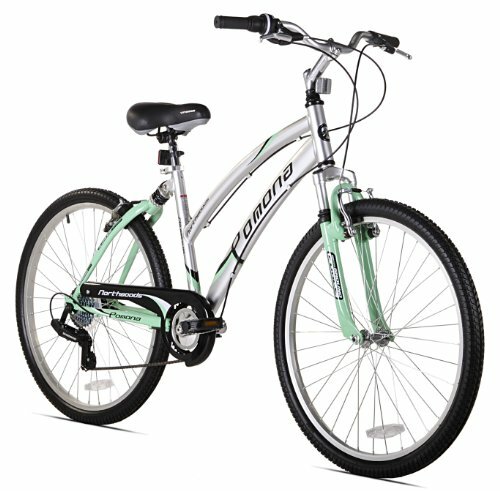 If you are looking for a bike to cruise move around the neighbourhood or to visit the malls, then the Northwoods Pomona Cruiser Bike for Women fits the job perfectly. It comes designed with a comfy seat and an efficient rear derailleur made from shimano components. Customized cruiser tyres with thirty six spokes and twenty six inches aluminium wheels for easy movement. A high quality frame made from aluminium for lightweight and durability. An ergonomically fit and designed steel handlebars incorporating twist shifters for proper balancing and control. A well-shaped cruiser seat designed to offer comfort. High quality Rear Derailleur from Shimano. 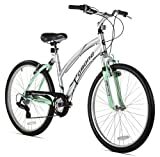 The Northwoods Pomona Cruiser Bike for Women is an affordable run around bicycle that comes equipped with standard components. It comes shipped partially assembled with a booklet showing instructions on how to put everything together. The instructions are a bit vague and not really helpful but if you have a basic knowledge in bike assembly, you’ll be fine coupling it together yourself otherwise, for a small fee, you can take it to your local bike shop for necessary tuning and adjustments. The bike is good for short distance rides like trips to the coffee shop, salon or other occasional leisurely trips. It offers a very comfy and soft padded seat and comes with a kickstand mounted at the rear wheel which is very useful as it eliminates the problem of having to lean the bike on walls or other things anywhere you go. The paint job on this bike is not too fantastic as the paints come off easily and some parts seem to be cheaply made. If your are below five feet four inches tall and love to feel the ground with your feet when sitting on the bike, you should note that the seat cannot be adjusted to go lower enough to make you have that feel. To fix this, you can get another seat post attached which can drop down and adjusted to whatever level you want. Overall, for the price and function, the bike delivers a value good enough for the money and with delicate care and handling, it will perform well. If just riding short distances is what you will ever be doing, then you should give the Northwoods Pomona Cruiser Bike for Women a consideration.